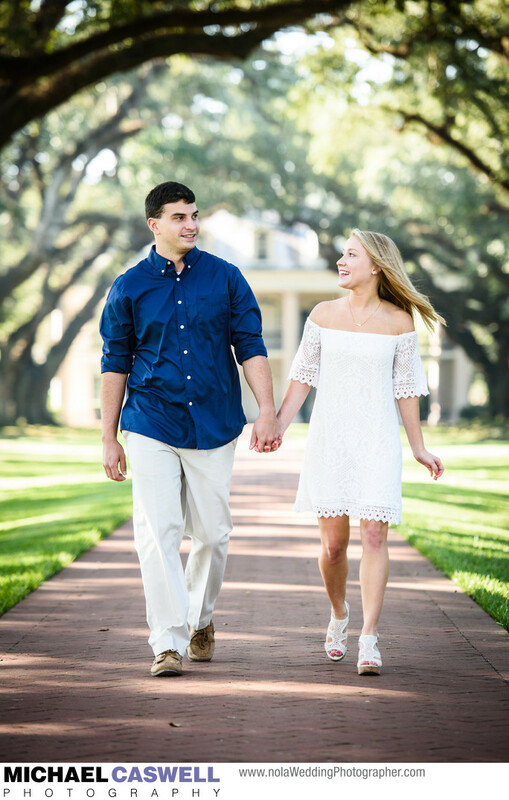 This couple came in from Virginia for an early morning engagement portrait at Oak Alley Plantation. This historic and majestic plantation dates back to the 1830's and is so named for its rows of magnificent oak trees that line the main walkway between the mansion and the Mississippi River, which gracefully frame the couple in this scenic image. Interestingly, the trees were planted here long before the now famous big house was built. There are many other attractive areas on the grounds to shoot at, including the individual trees along the walkway, a small bridge, the columns of the main house, a garden area adjacent to it, and more. Oak Alley Plantation is a very popular destination for tourists visiting New Orleans, and locals love it as well. While this location is indeed a bit out of the way, about an hour's drive from New Orleans, it is well worth it to have such a versatile assortment of backgrounds to choose from. It can sometimes be challenging to shoot in a spot so popular with tourists, but I am able to make it work by being selective about exactly where we shoot, choosing angles carefully, making appropriate lens and focal length choices, and sometimes just being a bit patient for the background to be clear. In addition to being a wonderful and unique location for bridal portraits and engagement portraits, this venue can also host an unforgettable wedding ceremony and reception or other special event.